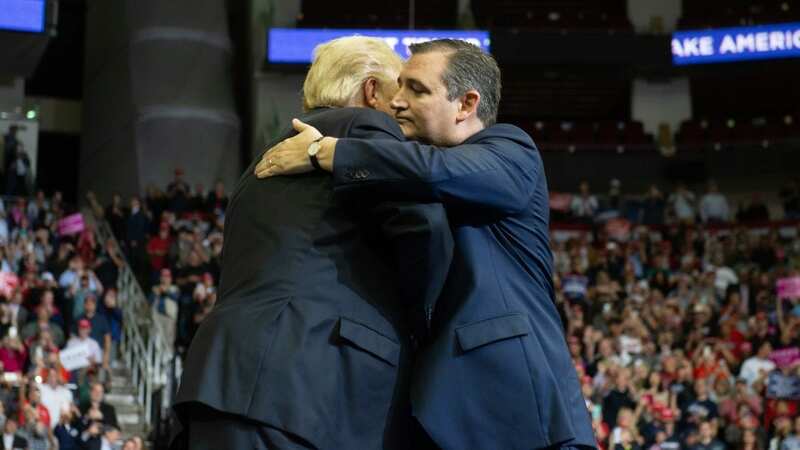 “In just 15 days, the people of Texas are going to re-elect a man who has become a really good friend of mine,” Trump said of Cruz after their extended embrace. Now, he’s “Beautiful Ted.” That’s how Trump described the Texas senator Monday to reporters before coming here to Texas, to Cruz’s hometown, to try and help him across the finish line. With just two seats to their advantage in the Senate and just over two weeks to go until Election Day, Trump and Republicans need to hold every seat they can, especially in red states like Texas. Democrat Beto O’Rourke has smashed fundraising records and is giving Trump and Republicans a scare in a state that has long been without a statewide Democratic elected official. The bitter presidential primary fight between Trump and Cruz went beyond policy differences and got personal. In addition to what he said about Cruz’s father, Rafael, Trump questioned the senator’s American-ness, given his Canadian birth; called him “worse than Hillary Clinton;” and ominously threatened to “spill the beans” on Cruz’s wife. Cruz returned the favor, calling Trump a “pathological liar;” said nominating him would be a “train wreck;” and refused to endorse Trump at the 2016 national convention. “I am not in the habit of supporting people who attack my wife and attack my father,” Cruz said in July of 2016. And yet, two months later, Cruz relented and endorsed the party’s standard-bearer. But all seems to have been forgiven — or at least selectively forgotten. Sunday, Cruz declined to call the president a friend when asked on ABC’s This Week if Trump is a friend or foe. There’s a cold calculus for why the duo have become useful to each other. Trump needs Cruz’s vote in the Senate — and no one is happier to save the chit than the transactional Trump. Cruz, on the other hand, needs Trump’s base for any chance to win re-election. That base was here. The crowd was a dotted sea of red Make America Great Again hats, with people holding “Finish the Wall” signs and swaying to Elton John’s Rocket Man, that came for the Trump show — and they got it. Many said it’s time to unite ahead of the midterms. Michelle Morris of Houston said if Cruz had not made up with Trump there could have been consequences. “I might have stayed home,” said Morris, who cited Trump’s support for NASA as a positive for Houston and the economy for why she thinks he’s been a great president. And so, here we are – with Cruz and Trump arm-in-arm, Cruz’s conversion to Trump Republican complete.